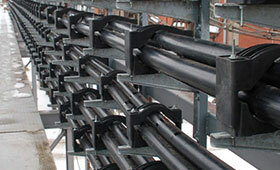 GRP or FRP Structural pultruded profiles are manufactured by combining a resin matrix with a fibre reinforcement. This is formed and cured in a continuous process creating a product of extraordinary strength and resilience. GRP Structural Pultruded Profiles provide a variety of benefits and mechanical properties matching or exceeding steel equivalents. 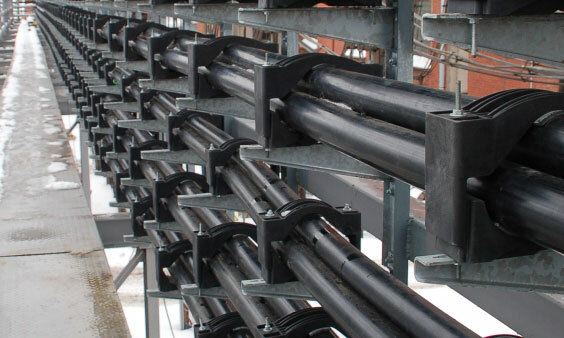 A wide range of structural profiles are available including U Channel, I - Beam, Tube, Box, Angle, Rod & Hand Rail. 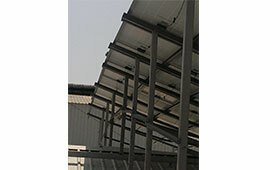 FRP is suitable for Desert, Coastal, Tropical, Plains, Polar Region etc. The profiles listed above are only a very small proportion of our range. If you should require a custom profile please do not hesitate to contact us. 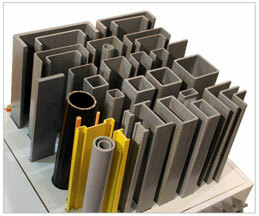 All profiles manufactured in accordance with CTI 137 Standard. This is a low lying structure and hence the wind loads are dramatically lesser compared to an elevated structure. A wind shield can also be provided which enables aerodynamic design capable of taking wind loads of 180 Kmph. 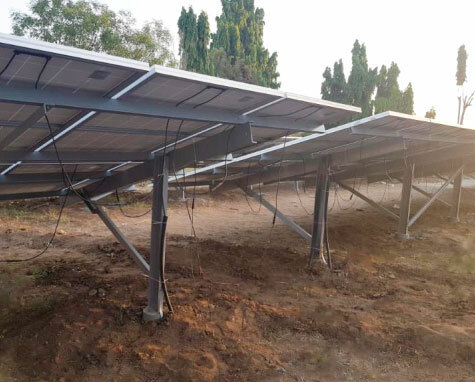 Since it is a modular structure & compatible for any module type, Installation involves only nut and bolt mechanism and can be done by unskilled personnel also. 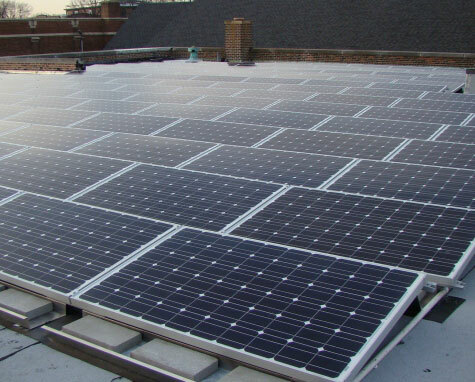 It’s a non-penetrative rooftop solution. A concrete ballast is provided for counter weight. Casting the concrete blocks is the only in-site work which needs be done, which is very minimal and not at all labour intensive. There are no point loads acting on the roof and hence no need to compromise with the structural integrity of the existing building roof unlike the penetrative structures. 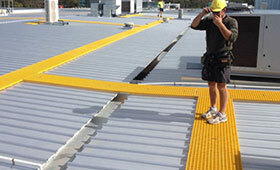 A Rubber/ Foam sheet can be provided to give enough friction between roof and the structure. 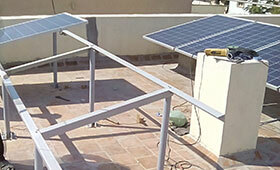 Roofs where obstacles are present and shallow structure are non-usable then elevated structures are used. 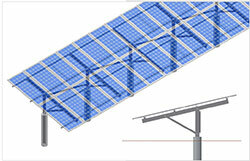 It can be elevated to a height of 1000mm and can provide maximum energy output. 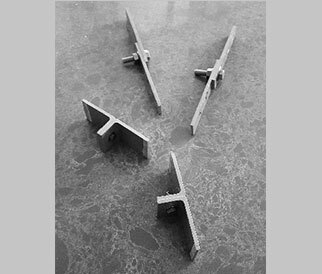 Light weight high strength material used for structure components. 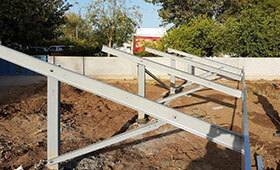 Option is provided for anchor structure and nonpenetrative structure. Industry grade resin is used for fixing concrete ballasts to the roof. 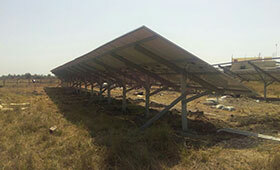 The structure is designed to take wind loads upto 180kmph and it is Compatible for any module type. Maintenance free structure is designed in a way that the existing structure’s service period is not jeopardized due to loading on the roof. 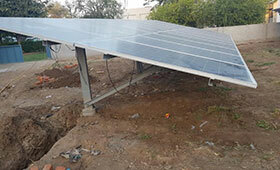 Innovative connecting mechanism is used to enable faster installation which can withstand heavy wind load. Also it is Compatible to mount any module type. 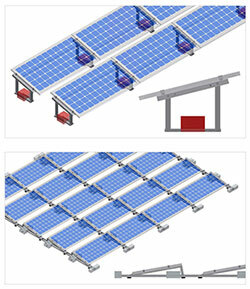 Non penetrative option is also available for any trapezoidal roof profile and for any inclination of the roofs. AERON strives to provide optimized construction, minimal assembly parts, innovative design ideas and on-site flexibility for quick and cost-effective installations. 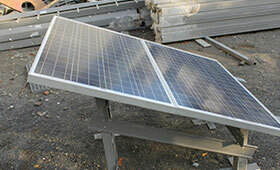 It is manufactured using easy manufacturing process with dedicated assembly lines and teams. 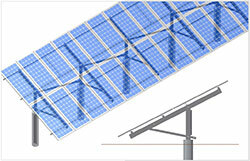 Designed to withstand high wind speed and rain loads. 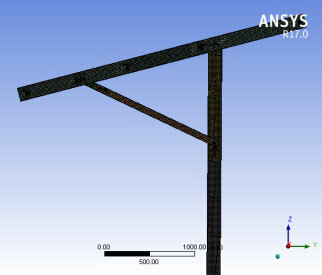 Engineering analysis can be provided for wind load. Due to simple design there is no requirement of earth levelling work even if the terrain is uneven. Optimized designs ensures significant savings on time and money. AERON offers comprehensive technical support and On-site installation supervision for projects. This orthodox design is very stable and size of the structural member is also optimised keeping cost in mind. 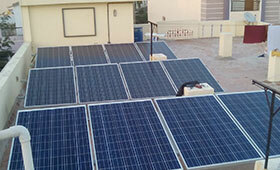 Installation is very easy and can be done at the rate of 1 MW / day due to light weight structure. Designed to withstand high wind speed and rain loads. 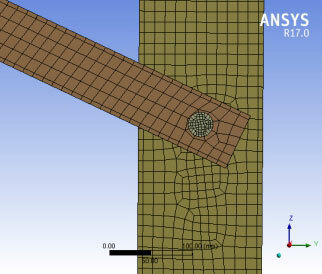 Engineering analysis can be provided for wind load. 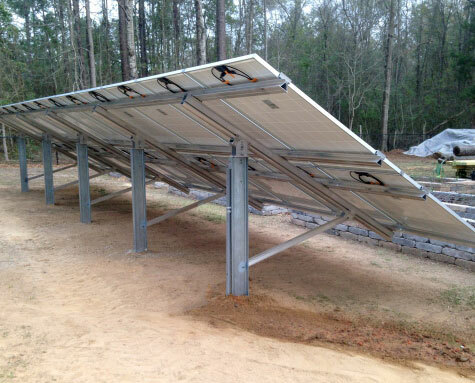 Our solution is suitable for virtually all terrains and site conditions. 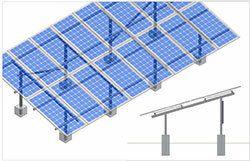 Our ground mount system, scalable for large, medium and small applications. Fiberglass material provides maximum strength-to-weight ratio and constructed of optimized material for maximum strength and durability. Our experienced team will help design and optimize your system for maximum return on investment. 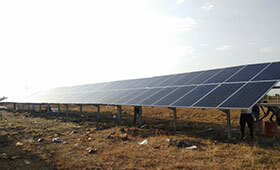 Now, Outputs for power plants in South India on par with power plants in North India at the same price / kwh. This is how Seasonal tilt design help. As a package of optimized solution for project specific customization, we deliver product in which no field cutting / welding is required. Our material is suitable for weather extremities -40 deg c to + 60 deg C with UV protection. 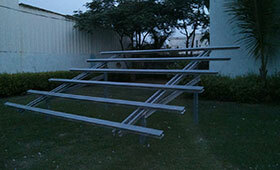 Structure is highly durable and corrosion resistant as it is not metallic. No recurring expense is projected for MMS. Typical elevation angle is 10 degrees to 40 degress. Easy to tilt mechanism to reduce operational expenses. Flammability ASTM D-635 Seconds Less than 5 sec. FRP / Fiberglass is gaining more popularity than the traditional material due to its several benefits and durable performance in challenging environments. In the area of Cable Manag! !ement, AERON can offer a versatile range of Solution, from its standard range to customer tailored solutions. 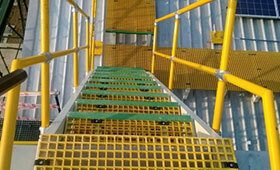 A well designed Composite system like AERON Composite gratings is needed for flooring, walkway and decking areas in corrosive environment for superior load bearing and corrosion resistance. 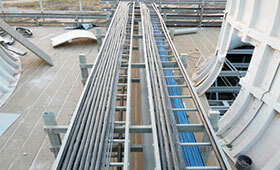 Major application are Walkways for accessing installation, Cable trenches, Rain water drains etc. AERON Trefoil Clamps / Cable Cleats are used for laying single core cables in Trefoil touching formation which helps to maintain magnetic symmetry thereby avoiding electromagnetic heating and loss of current. 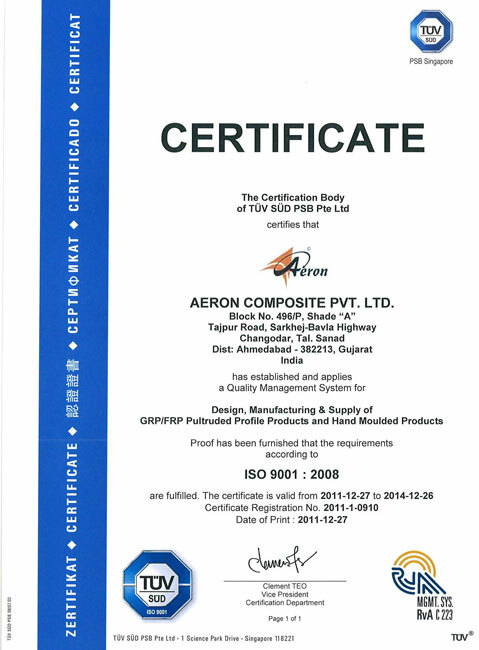 AERON Trefoil clamps are manufactured by molding process from Virgin Glass Filled materials. 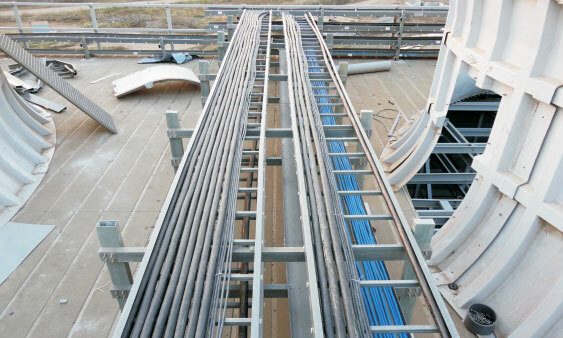 Glass filled materials are used to increase the flexibility of the clamp & to avoid the breaking of the clamps from the hook while tightening procedure of the three single core cables. AERON Hand Rail Systems offer now various solution for different situations. 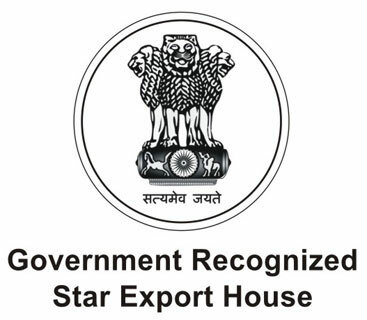 All systems are designed and tested according to the relevant standards. 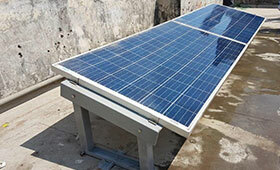 Systems are designed to satisfy both the End User in terms of performance as well as the Contractor in term of ease of installation and costs. 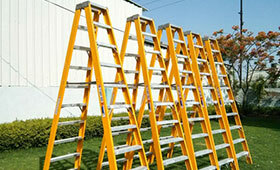 AERON Ladder system is designed and tested according to relevant standards. 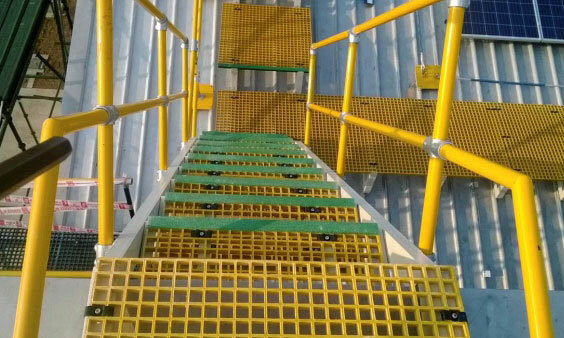 Ladders are designed to satisfy both the end user in terms of performance as well as the contractor in terms of easy installation and cost. 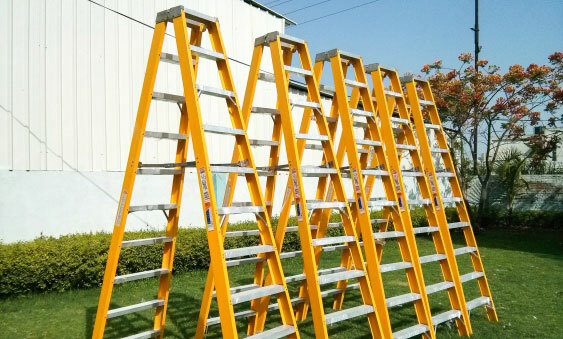 We offer Self Supported ladder, Wall supported ladder, Step ladder, Extendable ladder, Tilted ladder, Platform ladder, Safety ladder, Mobile Platform ladder and customized ladder as per user requirement.